Welcome to Guy Gardner Colon Warrior, quite possibly the number one resource on the internet for Guy Gardner: Warrior-era comics, and now also Extreme Justice comics! Come feel our pain as we go through every issue of these series, as well as some relevant side stories, since this was of course the ’90s, and tie-ins were mandatory. 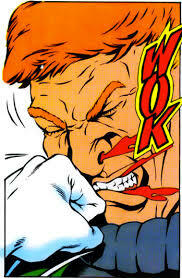 For the uninitiated, Guy Gardner: Warrior ran in the early/mid ’90s and is about Guy Gardner losing his ring and trying to figure out how to continue being a superhero. It starts off as a relatively normal story, but quickly morphs into one of the most ’90s plots that has ever been conceived. If you’re like me and have never even heard of this iteration of Guy Gardner, that’s probably because DC seems to have retconned and buried pretty much any mention of this strange period in Guy’s history. Not that I blame them; as we will find out later, things get pretty damn crazy, even for comic books. After several years of suffering, our journey through Guy Gardner: Warrior has come to an end, and what better way to celebrate than by continuing to slog through another ’90s-era comic by reading Extreme Justice! This comic features a ton of other once-entertaining Justice League members, and mercifully contains zero appearances by Guy Gardner! Luckily for us, this comic is also way shorter than Guy Gardner Warrior, so maybe the dread won’t kick in quite so bad. Guy Gardner: Warrior was reviewed once a week (in theory), but we’re going to slow the Extreme Justice reviews down to twice a month to give all of us some much-needed breathing room. Who knows? Maybe it will even raise morale! Whether you’re new to the site, or coming back for more, sit back, grab a beer or five, and prepare for the madness (or sadness?) of Guy Gardner Colon Warrior dot com!